IceLotto neither truly impresses, nor does it disappoint – for me, it sits somewhere in the middle. On top of the several popular lottery games it has on tap, IceLotto also offers multi-draw discounts and VIP perks, automatic prize deposits, a mobile app for on-the-go play, and solid security measures. You can also get a free ticket if upon signing up! Right off the bat, it feels as if they are poised to take on the big guns of the industry. But, dig a little deeper and you start seeing cracks. Game choices, accepted payment methods and supported languages, are fewer compared to other lottery sites. Budget conscious players should also be wary because ticket prices here are pretty expensive. IceLotto also doesn't do a pretty good job of explaining certain aspects of its service, which confuses more than it educates. In short, they need a bit more polish if it hopes to compete with industry stalwarts like theLotter or WinTrillions. At the very least, they are worth a look though. IceLotto offers a pretty good mix of the most popular lotteries around. IceLotto features a few lesser known games – like BonoLoto, for example – but for the most part, the most well-known and lucrative lotteries make up their game selection. IceLotto’s tickets are quite expensive, so you may want to steer clear if you have a tight budget. Leading lottery site, theLotter, is known for their slightly expensive tickets, but IceLotto’s are even more so. For instance, a 3-line, single Powerball entry will cost you €17.85 (or $21.02) at IceLotto, while the same will only cost you $15.01 at theLotter. A similar purchase for EuroMillions, meanwhile, will set you back €22.50 (or $26.49) at IceLotto, while it will only cost you $19.78 at theLotter. They don’t a good job of advertising it, but IceLotto does offer group play. The best part is that they offer group play for every lottery game in their collection. Most lottery sites only offer group play options for a fraction of the games they offer, but IceLotto makes it available for all 12 games. It’s actually really refreshing to see a lottery site that doesn’t skimp on syndicates – especially since IceLotto does not have any other game types (like raffles or scratch cards) on offer. IceLotto’s mobile app offers everything you need to play lottery wherever you go – but it’s only for certain people. Currently, their mobile app is only available to Apple users. Those using Android devices would have settle with the mobile-optimized website. It’s a good alternative, but not as convenient as a dedicated app. The app, after all, allows you quicker access to IceLotto’s lotteries. You can also check on the latest results or get instant notifications, and play in the lotteries that you want, whenever or wherever you are. IceLotto currently accepts 9 payment methods, but they don’t do a good job of telling you that. For the most part, 9 methods are serviceable enough, but more banking options mean more players from different countries can easily play in their lottery games. What I didn’t like was how confusing their information on the accepted banking methods are. Their Banking page, for instance, says that they accept 5 deposit methods, namely: Visa, MasterCard, Skrill, iDeal and bank transfers. If you scroll further down their website, meanwhile, NETeller, giropay and Yandex are included in the list of payment methods. But, when you are confirming your order and payment details, the options available to you are Visa, MasterCard, Maestro, Skrill, iDeal, NETeller, Qiwi, Yandex, and uPaySafe. In any case, their Banking page does do an okay job of providing more details about some of the payment methods. I just wish that they updated it to include information on the other methods they claim to accept. It’s clear that IceLotto takes security very seriously – as evidenced by the numerous security and trust logos displayed on their website. For starters, IceLotto makes use of GeoTrust SSL encryption to ensure connections are safe and away from prying eyes. Their website is also cleared by McAfee SiteAdvisor and Norton SafeWeb, and has a 100/100 reputation score on Webutation. Beyond that, they also have verification logos from Visa and MasterCard, so you know they are, without a doubt, a legitimate lottery site. I was impressed by how helpful IceLotto’s customer service was when I contacted them – but I have a few minor gripes. For starters, while IceLotto’s FAQs are pretty helpful – for the most part – it lacks some key information about their service. The “Winnings” section, for instance, doesn’t really tell you if your prizes are deposited to your account or if you would need to travel to claim jackpots. Most lottery sites tell you these information upfront, but with IceLotto, you’re pretty much on your own. That’s exactly what happened to me. I couldn’t find any information on how their prize claiming process goes, so I had to contact them via live chat. I waited several minutes to get connected with a live chat agent, but once I did, the agent (David) was quite helpful. He was a bit pushy trying to sell me tickets, but I guess it’s also part of their support team’s job to do some light marketing. He did clear things up for me, which is what is important. Beyond that, if you would rather contact them through other means, IceLotto allows you to do so via phone, email, and fax. One of the benefits of going with IceLotto is their 24/7 support – or so they say when you sign up. However, if you look closely at their “Support” page, they immediately contradict themselves (yet again). You can contact their support team from Sunday to Friday, every 10am to 7pm, GMT. IceLotto does a decent job educating players, but they make a few missteps that undercut the overall effectiveness of their materials. Like most lottery sites, IceLotto includes informational tidbits about each lottery they offer right on each game’s individual pages. So, for instance, if you wanted to learn more about Powerball – what it is, how it works, etc. 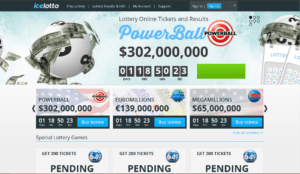 – all you need to do is visit the Powerball page and scroll down. 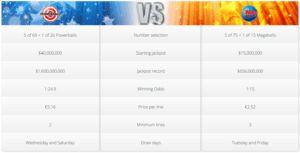 IceLotto offers interesting information about lotteries – like this handy comparison table. For the most part, the information they provide is pretty helpful. They even have quick comparison tables for some games (like Powerball vs. MegaMillions). The thing is, whoever designed the layout of their website decided to put some key information at the bottom of the page, just above the footer menu. This makes the information easily missed – which is especially true for some lottery game pages, like Powerball’s or EuroMillions’. IceLotto’s website is pretty easy to navigate on desktop and mobile. It doesn’t stray far from the industry norm in terms of site design, so it’s easy to get familiar with it. Their front page, for starters, features a carousel that displays all the latest jackpots, plus quick-buy options for some group play games. These make it easier for you to get to your preferred lottery in no time. Up top, the menus are clean and links are organized logically. IceLotto’s website is pretty easy to use – not to mention easy on the eyes. Overall, you can accomplish pretty much anything in just a few clicks. Even newcomers should have no issues navigating IceLotto’s website or playing their games. Even on mobile, their website is a breeze to use. One gripe I have is that IceLotto only supports 6 languages: English, Spanish, German, Russian, French, and Dutch. Players who are not fluent in any of the supported languages may have a harder time using the website. There’s always Google Translate, but we all know how hit or miss that can be. IceLotto impressed me with the various promotions they offer to players. As previously mentioned elsewhere in this review, I got a free Mega Millions ticket after signing up. In fact, there was a scanned copy of the ticket already waiting for me in my account – which was a pretty nice touch. No need to do anything else, either; that ticket is 100% yours the moment you complete sign up. Beyond that, they also offer multi-draw discounts – so the more draws you choose to participate in, the bigger the discounts get. You can get anywhere from a 2% discount to 25% off. Of course, that means you’d have to participate in tons of draws to qualify – but this is definitely good news for those who were planning on entering multiple draws in the first place. IceLotto’s promotions are pretty good! Finally, IceLotto also provides a VIP Club program wherein anyone who plays any of their games can qualify. VIP members also get assigned an account manager that can help you purchase tickets or update you on results, special jackpots, and more. VIP members also get to enjoy cash back bonuses once they reach the required VIP points per tier. Every €1 spent gets you 1 VIP point, and you need at least 1,000 points to get Bronze level status. Check out the table below to see how the VIP rewards program works. Creating a free IceLotto account shouldn’t take more than 10 minutes. It’s that quick and easy! Click on the blue “Sign Up” button located at the upper right corner of their website. Fill up the short form that pops up with the following details: your email address, your password, your full name, and your mobile/landline numbers. 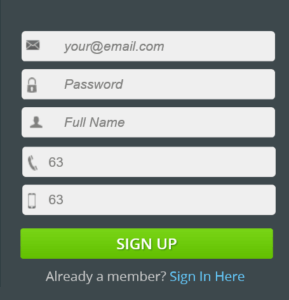 Click on the green “Sign Up” button once you are done. It’s also important to note that IceLotto gives new sign ups a free lottery ticket. This is no joke – I actually got a free Mega Millions ticket immediately after signing up! Hats off to the IceLotto team for this really cool perk. Playing lottery games at IceLotto is just like playing in any other lottery site – which means both newcomers and veterans alike shouldn’t have a hard time purchasing an entry. Log in to your IceLotto account. Pick the numbers that you want to play. You can do so either manually or via the Quick Pick options. Choose whether you want to participate in a single draw, or in multiple draws. Click on the green “Continue” button. Review your purchase details and select your payment method. IceLotto makes prize claiming a breeze for winners – but, strangely, they don’t openly divulge this information on their website. Winners are notified via email, but because IceLotto provides a scanned copy of your tickets, you can also check your account manually to see if you’ve won. All pretty standard stuff, so far. However, prize claiming is where IceLotto differs from most lottery sites. 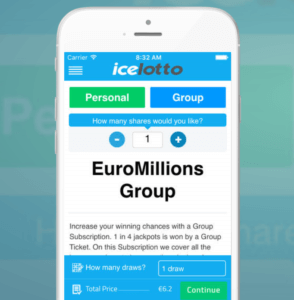 Where most lottery sites would have big jackpot winners travel to a lottery games’ country of origin to claim their prize, IceLotto automatically deposits prizes to your account. This is true whether you win the jackpot or lower-tier prize. Strangely, they don’t really tell you this upfront! I had to bug their (helpful) live chat agent to get a clear answer. IceLotto has several things going for it, but it certainly is not the best out there. Check out these alternatives for a more satisfying lottery experience! theLotter has many games to choose from. With over 53 lottery games, several syndicates and the occasional raffle to choose from, theLotter is king when it comes to game selections. They accept way more payment methods! theLotter accepts over 29 payment methods, including Visa, MasterCard, Diners Club, Discovery, Maestro, entropay, and many more. Their prices are pricier than the norm, but are more affordable than IceLotto’s. As I mentioned earlier, theLotter is known in the industry for their pricier-than-usual tickets – which is the effect of their handling fees. That said, their prices are definitely more affordable than IceLotto’s. WinTrillions offers tons of game choices! You have 20 lottery games, 13 syndicates, and several raffles to choose from. As far as game variety goes, WinTrillions has got it in the bag. They accept over 30+ payment methods. WinTrillions accepts a wide array of payment methods, including Bitcoin, so players from all over should have no problems depositing or withdrawing money. Single draw purchases are not entertained. WinTrillions only allows purchases from multiple draws, which makes them a more costly option. LottoKings’ prices are pretty affordable. Ticket prices here are far and away more affordable than IceLotto – and even theLotter! Prize claiming is a breeze. LottoKings can claim prizes on your behalf – which you can then claim via two ways: check or through the nearest LottoKings office. You can, of course, also choose to claim prizes on your own. Even though LottoKings is a lotto agent, they don’t scan players’ tickets. Instead, they send you a purchase invoice that serves as your proof of ownership over the ticket. The Bottom Line – Should You Use IceLotto? It’s worth checking out, but don’t expect a smooth-sailing lottery experience. Overall, IceLotto is decent enough; you get to play in the most popular and lucrative games, and you get to save up via various promos and discounts. They are also pretty serious when it comes to player security, and you don’t even need to travel far to collect winnings. That said, IceLotto makes several missteps that really hold them back. On top of the numerous inconsistencies I found throughout their website, their prices are some of the most expensive in the industry. They also lack some game types and their accepted banking methods could use some sprucing up. Overall, IceLotto has some ways to go before they can even hope to compete with the big guns of the industry. Right now, they fall short in many areas. At the very least, give them a look – you can get a free lottery ticket after signing up, after all! IceLotto is a lottery site owned and operated by Y&M Hans Management Ltd., which is based in Cyprus. They offer a lottery agent service wherein they purchase actual lottery tickets on a player’s behalf. This lets players from all over participate in a wide array of lottery games from the comfort of their homes. IceLotto has been in the online lottery scene since 2011.